My Christian name was Michael Peter Dennis Noonan, I was born on the 12th of March 1965. I was born in the Rep of Ireland in a city called Waterford, the most ancient in Ireland, which was built by the Vikings. I was born in a staunch Roman Catholic Family, a family who had priests and Missionary Nuns, whom were my grandaunts. My Grandparents on both sides were extremely staunch Roman Catholics and passionate about their beliefs. They showed great reverence towards the Sacred Heart (Jesus) and the Blessed Virgin Mary. My parents were Catholics, but not church going, but I was moulded mostly by my beloved grandmother from my mother’s side. She was from Wales and a very devout Catholic, she was married to my grandfather, Michael Murphy, whom I had the honour of being named after him; he was very religious and devout Catholic whose brothers and sisters were priests and Missionary Nuns. My grandparents and the parents of my beloved mother were truly the ones who inculcated the love of God in to my heart and taught me all that I know about ethics, truth, kindness and respect for others. I myself became very God conscious and through my grandmother, who made sure that I went to Church and attended mass on a weekly bases, and indeed she would often check and ask me what was the gospel or the epistles’ that was read and which Priest offered the mass, there was no escape from missing mass; but in truth I wanted to attend anyway. I would also part take of the Eucharist celebration on a weekly bases and I would also attend confessions weekly. I was educated at St Paul’s primary and secondary school and completed by 3rd level education in Theology and Philosophy from University of Wales Trinity of St David. I knew something about Islam through my studies and I had visited Tunisia in North Africa where you can say I saw a living example of Islamic way of life; it was there that I was introduced to Islam, and the order of Sufism. And it was from there that my interest in Islam started to develop. On my arrival in Tunisia like most young Irish men I was unaware of the Islamic customs and traditions of purdah and separation of men and women, but this really had an impact upon me from a moral perspective. I was quite impressed even though my other Irish friends both being male and female were not at all impressed, rather they felt it was oppressive. We saw that Muslim ladies were swimming in fully covered outfits and also the Irish girls being asked to cover up, of course I could see the reason why my friends felt it was oppression, but actually I admired it very much. It was during this time I heard my first ever Azan and I was spelled bound. I asked a local person, whose English was very good, what it was? And what did it mean? When he explained everything, I was overwhelmed by it all. I made my mind that when I return to UK I would pursue more about Islam. The next time my Christian friends went to Hyde Park to preach I went with them. It was my first time ever to Hyde Park for preaching, it was amazing to see all faiths and also those with just opinions in one place, but I was soon in front of Christians debating with Muslims and it became very clear! That Muslims were hammering the Christians on theological ground even though I had studied theology and also spent over a year studying biblical studies with the World Wide Pentecostal Church to see if there were any differences between evangelism and Catholicism but nothing could prepare you for this. There former Christians who had accepted Islam many whom today are well known Islamic personalities like Abdur Rahim Green, Yusuf Islam, Jay Smith (Christian apologist) all who were to become friends and enemies. I met Sufis, Shias Wahabbis, Sunnis and I was impressed with Islam. I studied Islam over the next two years going to Hyde Park every week, Piccadilly Circus (another area of debating) a place where I was to preach for over 15 years myself as well as Hyde Park in the future. I had met many Muslims over two years from all sorts of Islamic schools of thought, the one that interested me was Sufism (Naqsh Bandi). Many Irish friends were embracing it, but for some reason I held off. I started to go to Regent Park Mosque and Goodge Street Mosque, a Muslim League Mosque (Wahbbi’s Mosque) and I became interested in them because of their discipline and strictness, but it became very clear after a while that some of their teaching was very radical. One day I was invited to a wedding (non Ahmadi salafi) I went and it was my first ever Islamic wedding I was impressed. All the men with flowing gowns long beards embracing each other with ‘Assalamo Alaikum’, shaking hands and much more. During the wedding there was a room where men were sitting in groups, due to me being white non-Asian people were happy to see me and started to dawah to me. I also noticed a discussion between two Muslims who were surrounded by a group of men listening, the debate was about ‘the second coming of Jesus’. I started listening myself. One Muslim was debating that it would be Jesus himself that would come and the other was debating ‘no it would be someone else in place of Jesus’. The debate was based upon (which I know now – not then) a hadith from Bukhari that when Jesus was to return he would go around and kill all the pigs, and break all crosses and remove Jiziya. Muslim (a) was debating that it was to be understood literal and Muslim (b) was arguing it was metaphorical, I asked Muslim (a) if I could make a comment (by the way he is now a famous Asian Labour Party MP) and he and Muslim (b) said fine. I explained that Muslim (b) made more sense and his interpretation of the hadith was more realistic. After they both finished, this Muslim (a) asked me if I was a Muslim, my response was ‘I have come to believe that the Holy Prophet may peace be upon him was indeed a Prophet and that the Holy Qur’an was a Divine book, but I have not formally declared myself a Muslim’. His response was ‘then don’t tell me about Islam‘, he said further ‘this guy (Muslim (b) is not a Muslim, he is kafir’. My response was, ‘is he a Shia as they are only Muslims I have heard being called Kafir?’ Again his response was, ‘he is worst, he is Qadiani!‘. And then he walked away. I approached this other Muslim and asked what a Qadiani was? He simply replied that he was not Qadiani but an Ahmadi. I asked to explain what an Ahmadi was, he explained to me that he was indeed a Muslim, but belonged to a community called Ahmadiyya. 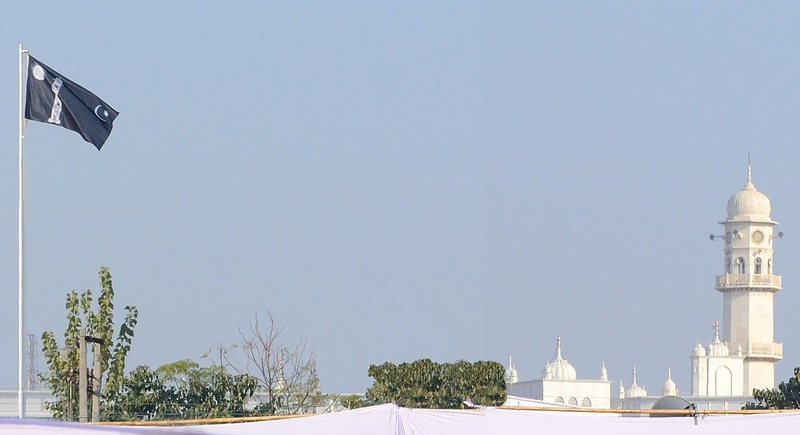 He elaborated for the doctrines of the Ahmadiyya Community especially about the belief that Jesus did not die on the cross, and that someone else would return in his place. I must admit I rejected this belief outright! As being a former Christian I loved and believed that Jesus would return for the salvation of all mankind, but as I came to know about Islam and found truth in it, and that it also mentioned Jesus and about the blessed Virgin Mary, it impressed me. Of course the very fact of the excellent character of the Holy Prophet of Islam also attracted me to Islam, and that it would be Jesus who would come back, was far greater. But now to be told that it would not be Jesus, but someone else, wow! No way had I thought to myself. This Ahmadi asked me if I would read a book that he wanted to give to me, I said, ‘yes I would’. The book that was given was more of booklet but it was called ‘Tomb of Jesus’. It was all about the survival of the cross and it gave many biblical references, which was impressive. When I got back to London, I started reading before sleeping, and as I was reading it, I was amazed at the Biblical evidence it was presenting for the survival of Jesus on the cross. I could not put the book down, I continued reading it and I finished by 2am. I remember going on my knees and praying to God that is it possible!!! Is it possible that all these years (I was 22) I have been worshiping a human and that he did not die on the cross and that he survived and went looking for the other tribes of Israel? This, putting it mildly ‘I felt that I was just hit by a bus’. The very next day I made contact with this Ahmadi and asked to see him. As I was also living and working (part time as I was studying) in Central London we agreed to meet. When we met I had loads of questions based upon the book he gave me. He was happy that I found the book to be helpful, but he said ‘I have no knowledge’ but he gave me another book to read and explained it would answer my questions with regards to the other book. He gave me ‘Jesus in India’. I took this book home and started reading it. It took me a while to digest its content, and about a month to complete. It was another book, which simply destroyed any argument I could think of with regards to the issue of the return of Jesus Christ. It just crucified me. It finished any intellectual or academic point with regards to Biblical evidence on the crucifixion of Jesus Christ. This book really bothered me a lot, almost every day I would be thinking about it in points and content. I had many Christian friends that I wanted to consult and also Muslim friends, but for some reason I did not seek their advice. It was actually a good thing as they would have tried to convince me that the Ahmadiyya is false. Anyway another month passed by. I went almost every week to Hyde Park and watched the debates between Christians and Muslims and became friendly with a renowned Christian apologist Jay Smith (who today is an arch enemy of Islam and Ahmadiyyat true Islam). I heard anti Islam debates and attacks upon the Prophet of Islam may peace be upon him and it was two debates in particular that really changed my life. The First one was, hearing Muslims debating about salvation and how the Holy Prophet may peace be upon him was the Messenger of Allah, and that now he was the only way to Salvation. The response from the Christians was ‘where is Muhammad may peace and blessings of Allah be upon him? Is he alive or dead? Of course the Muslims in their innocence said ‘he is dead’. The Christian (Jay smith) said, ‘ahh Muhammad is dead and buried in a grave, praise the lord Jesus, who rose from the dead after the crucifixion and is alive in heaven’. He died for the sins of the whole of mankind, but your Prophet, just a human, died and was buried. This is when I remembered the books I read that actually there is a belief that Jesus survived the cross and he was just a humble Prophet and he died a natural death like all humans. This made me decide to contact again this Ahmadi. Then there was an incident when I saw a young Muslim the same age as me then (22) he had a beautiful beard (long) and was wearing very simple clothes. He was asked about the nature of God according to Islam, he beautifully explained about tawhid. I was so impressed, that deep down I knew, I wanted to be a Muslim. The second incident which convinced me that Islam is what I truly wanted to follow, but to be honest I was still hanging on to Jesus. I started to visit Hyde Park frequently and also Leicester Square where a lot of preaching by Christians and Muslims would take place almost every night. I met with many Muslims and started to question everything about Islam. I had good Sufi friends, Shia and Salafi, they were all asking me to take the shahada, each time I considered it and planned to do it, something kept stopping me, at least three times something stopped me. I needed more questions answered by this Ahmadi friend. I made contact with this Ahmadi and he asked me to come to their convention (Jalsa Salana), where there would be scholars who could explain everything to me. I explained that I would be going back to Ireland on that weekend. He pleaded with me to consider attending the convention. I said ‘okay, I’ll go for one day only’. The day I went was a Friday, this was 1990, and the first thing that hit me was the volume of people and the various nationalities and of the majority being from Pakistan and India. I was placed in the main marquee where the entire English-speaking guests would sit. After a short time I saw people standing up and shouting and raising their fists and arms shouting something (Nara takbir). I was amazed and thought these people were mad, but suddenly I notice a man wearing a turban, entering the marquee and there was an entourage of people with him. He went on stage and the formal ceremonies (Quran, Nazam) began. I remember his speech very well, it was about tarbiyyat of the Jama’at. I was very impressed because I never saw a man, a leader, rebuke his own people and guide them towards God. After he spoke and then left the stage, I started to run after him as I wanted to meet him. I was running fast, so fast that I ran into someone and he fell down to the ground. I picked him up and asked him if was okay? He said he was fine and asked me where was I rushing to? I told him I want to see the man in the white turban. He informed me, that you can’t just see him like that. I explained that I never saw or heard a man like him and I need to see him. He explained that this man was the Khailifa and you can’t just see him like that. The man I bumped into was Imam Rashid. He requested me to come back tomorrow and you can see the Khalifa in a specially organised function and Question & Answer session. The Imam told me that I would come as his guest. The next day I returned and my Ahmadi contact was very surprised at my eagerness. We arrived at Islamabad and I was taken straight to the Question & Answer Marquee and there were over 300 guests many of whom were European either English or German and many others. After a short time everyone was told that the head of the community was coming, we all sat down, I was in the front row, literally right in front of the Khailifa. 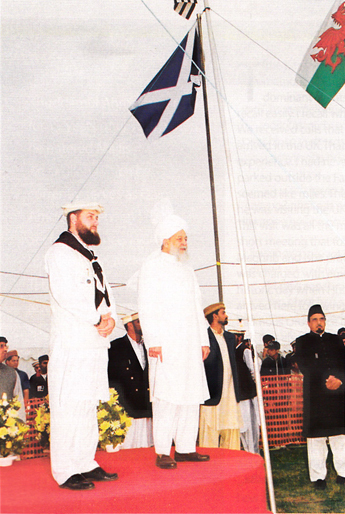 When the Fourth Khalifa (r.h.) came in, he looked so beautiful and bright like a shining star. The Question & Answer had not begun yet just looking at him overwhelmed me. Before the session started, the Khalifa asked an English man why he was not doing the recitation of the Holy Qur’an. This English man (Maulana Tahir Selby, great man and great missionary) smiled and said that someone else was doing it. After the formalities the session started, each question was profound and the answers were astonishing. The Khalifa was able to answer every question with such authority, it was amazing. I could not keep my eyes off the Khailifa for a second. When the Question & Answer finished, I went to another English looking person, who turned out to be Scottish man, Yahya Mckenize, a convert of 7 years. I asked how do I become a member of this community? He was shocked! He said ‘you want to join the community?‘ I said ‘yes!’ He said ‘you have to fill out a Bai’at form‘. I personally didn’t feel the need of filling out a form and even questioned it, but it was explained to me and I said okay. But they had to speak to Imam Rashid. Imam Rashid asked me to sit with Maulana Bashir Ahmad Orchard, an English Missionary. I asked him loads of questions and he answered the best he could. He noticed that I had a bundle of books that Imam Rashid asked me to read, but said to me, ‘look you can take the high road and read many books or you can take the low road and pray to God to give you an answer about the truth of the Jama’at’. After the Jalsa I went to Fazl Mosque to meet Imam Rashid as I wanted to sign Bai’at form, but he asked me to read more books and asked if I truly understood who the Promised Messiah may peace be upon him was? Of course, he was right, I knew academically, but spiritually probably not. Anyway I took more books and in a few days I left UK for my country, Ireland. On my way home I was practicing telling my parents that I want to become a Muslim or I have decided to become a Muslim. But when I finally arrived, after been away for over four years, I was unable to tell them straight away, so I put my books in my room and spread them out in hope that they would see them. But it took some time. One of the first problems I faced was that almost every morning, my father would offer me bacon and eggs for breakfast. I refused every time, but then on the Sunday, (where all Irish people never refuse bacon, eggs and black pudding, which is completely Haram but it used to be my favourite) when my father brought me my breakfast I said ‘no thanks just eggs’. Well it was an explosion, my father became very angry and asked ‘have I become a Muslim?‘, I was shocked and immediately I said ‘yes!’ He became angry and ran upstairs and told my mother, who came down reciting ‘hail Mary’s‘ and the Lord’s Prayer. Both were very upset. My mum saying that she saw strange books in my room, (the Holy Qur’an) and she had seen me doing strange exercises in my bed room (Salat). Within the hour my brothers and sisters came to the house debating and trying to convince me that I had made a mistake or I was not in my senses. Later during the day my father called the local priest, who came to see me, and he tried to persuade me that the only path was through Jesus Christ. I told the priest not to waste his time, as I have chosen my path. For a number of weeks my family was putting me under a lot of pressure, and they did not speak to me properly. There was tension in the house all the time. I decided to move to another city in Ireland, Cork City to get some space. During that time my Father came to see me and my friends, all still trying to convince me that I made a mistake. Being a young 23 year old, I started to think that perhaps they are right, I am Irish, all my friends and family are Irish, my whole social life was the Irish culture ( i.e. pubs, night clubs, girlfriends etc.) even though I did not drink, but still all my friends did. I started to ask myself, ‘am I being silly, is Islam for me.’ All sorts doubts were coming to mind, I missed my friends, and my ex girlfriend whom I cared about a lot as I was still in love with her. All these things started to effect my mind and heart. Oh God, I believe in Jesus, a noble Prophet and I believe that Muhammad may peace be upon him is also a Prophet and I only want to follow the truth, so which of these two Prophets should I follow? When I woke up I realized that I was told to follow Islam. I packed my bags and decided to return to London, as I needed to be near Muslims. My parents were distraught, my mum begged me to stay, my father had tears in his eyes, but I had to go. On my return to London I went straight to the Fazl Mosque to see Imam Sahib and told him my dream and I declared my shahada. But when a few weeks passed and I met some of my old Muslims friends (non-Ahmadis) they were happy to see me, and asked where have I been? I told them I went back to Ireland and now I am back, I told them that I have declared my Shahada. They were very happy and one person who was with them asked ‘which mosque do you attend?’ as he has not seen me in the mosque. I told him ‘I go to the London Mosque’. He said ‘you mean, Regents Park Mosque?’ I said ‘no, the London Mosque in Southfields‘. That night after sleeping I saw the Promised Messiah may peace be upon him in front of me and he said ‘Ahmadiyyat is Islam and Islam is Ahmadiyyat’. He then said ‘if you are ever in doubt again pray in this position, and I saw the Promised Messiah may peace be upon him fall in prostration’. When I woke up I was sweating and I realized that Ahmadiyyat is the true Islam. Alhamdulillah. 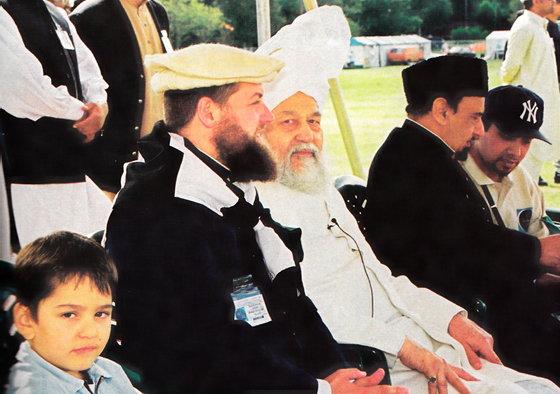 Now by the grace of Allah Ibrahim Noonan Sb is serving as a missionary in Ireland.